If my kids consistently ask to have this soup, then that must mean it’s a good recipe right? The first time I made this Roasted Tomato Basil Soup, it was an instant hit. The whole family devoured it. It’s actually a really easy recipe that requires little effort, but the outcome tastes like it’s a gourmet soup from your favorite restaurant. It’s light and fresh, but still satisfying. Most of my favorite tomato soups are creamy, and unfortunately loaded with heavy cream or cheese, meaning they have a lot of fat. But my tomato soup recipe has that thick, creamy, velvety texture that I love but without the heavy cream or cheese. By using my immersion blender, I’m able to get such a divine, buttery texture, without having to add in the ingredients I don’t want. And the bonus is that I can blend it all in the pot without having to transfer everything to my blender. Fewer dishes to clean up! Yay! Seriously, if you don’t have an immersion blender, you are missing out. It’s one of my favorite kitchen tools. But let’s get back to the soup. Another important step is the roasting of the tomatoes. It adds a lovely char that contributes a delicious, smoky flavor to the soup. Don’t skip that step! 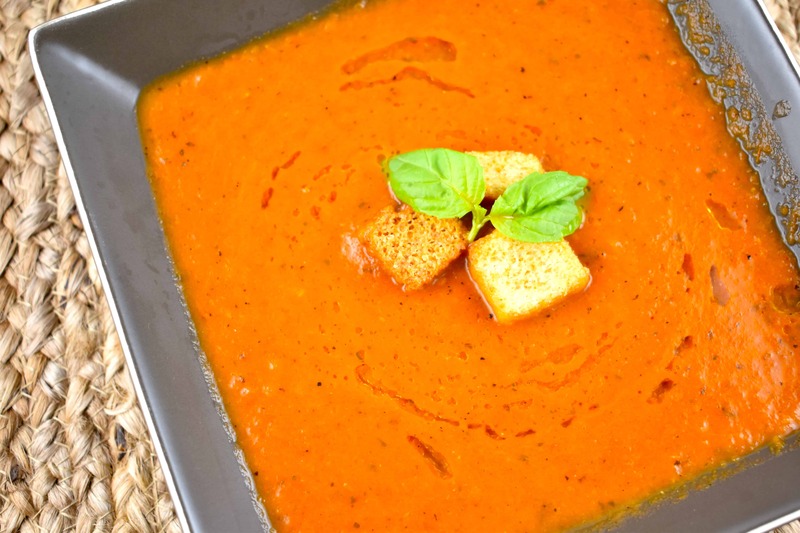 And with just 4 Points, this Roasted Tomato Basil Soup is a perfect recipe to help keep you on track. A simple, dairy-free tomato soup that’s light, healthy, and bursting with fresh flavors. You’ll never want canned tomato soup after you’ve had this! Preheat oven to 400 degrees, and line a rimmed baking sheet with parchment paper. Toss tomatoes and garlic cloves with the olive oil, and place them on the baking sheet. Roast for 35 - 40 minutes, or until the tomatoes are charred. Heat the butter in a stock pot or Dutch oven over medium heat. Add in the onions, and red pepper flakes. Sauté for about 5-6 minutes or until the onions start to brown. Stir in the canned tomatoes, basil, oregano, and stock (or water). Add in the oven roasted tomatoes and garlic, including any juices on the baking sheet. Bring to a boil, and simmer, uncovered for about 25-30 minutes, stirring regularly. Using an immersion blender, process the soup until desired consistency is reached. Season with salt and pepper to taste. I apologize for sounding picky, but for a vegan recipe, shouldn’t the butter be replaced with a vegan alternative? I am confused – I put in the nutritional values at the bottom of the recipe and it come out to 10SP, how do you get 4? Hi Christina! To answer your question, it’s important to keep in mind that zero point foods are NOT included when determining a recipe’s SmartPoints® value (with the exception of blended fruit beverages). This includes fruit, vegetables, eggs, beans, skinless chicken and turkey breast, tofu, and more. Get the full list of zero point foods here: https://www.weightwatchers.com/us/m/cms/article/all-about-our-200-zero-points-foods. So when you see the Points value posted, it is based ONLY on ingredients that have a SmartPoints® value. HOWEVER, the nutritional info that I post contains the data for ALL ingredients. As there are many people who read LaaLoosh and do not follow the Weight Watchers plan, this provides them with the nutritional info that they need. Yes, you can use all canned tomatoes, but if you try to roast them, they’ll be too wet, and you won’t be able to get that char on them. That char is what gives this soup such a delicious flavor! Do you removed the charred skins of the roasted tomatoes before adding to the soup?